For some reason I always feel like my little guy needs new stuff to play with. I don't know why because he has a TON of toys (he's my mother in law's only grandchild). 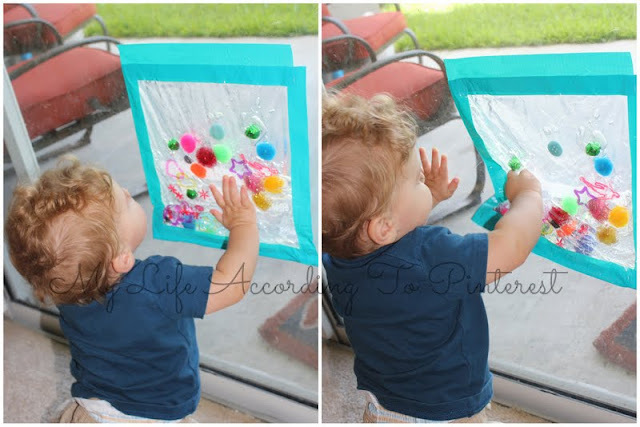 I saw this sensory bag on Pinterest and I thought it would be the perfect thing to make for Baby Boy to play with and explore! Plus, I knew it would be something that would expand his sense of sight and touch. 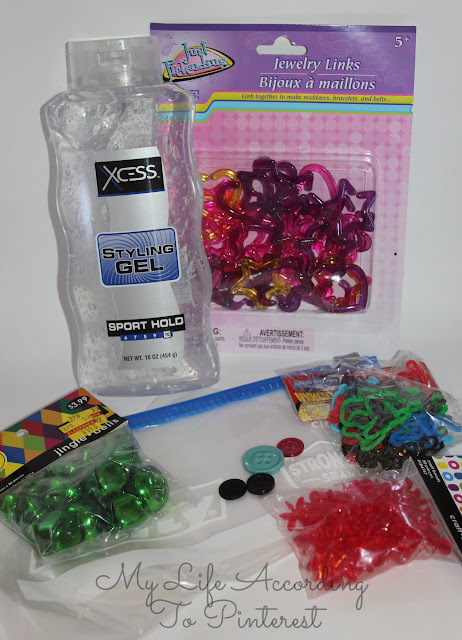 All you need is a ziploc bag (I used a freezer bag), some bottles of cheap dollar store hair gel, duct tape, and whatever little trinkets you want to put in your bag. I used some pom poms, little bells, buttons, silly bands, a few beads, and some little jewelry shapes. Almost all of these things can be bought at the dollar store or it might even be lying around your house! My little guy is 10 months old and he liked playing with this. He really liked poking at the bells that were in there and squeezing the bag. I think this will be something that he likes even more as he gets older. Babies are so curious and looking at all of the little things in this bag and squishing and holding it really satisfies that curiosity. I even taped this to the sliding glass door so he could stand and explore with the light shining through it. 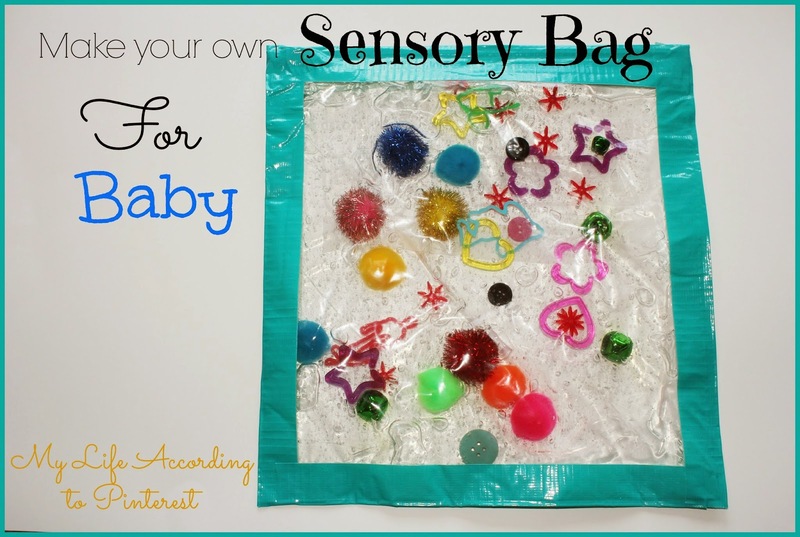 You could make a sensory bag for so many different themes and to fit lots of different ages. If you have an older child, they could definitely help you make this! You could put all different colored pom poms or beads and do a color bag to help your toddler learn colors. Or, to help with letter identification, make a bag with all different letters so your child could hunt for a certain letter. You could even put a drop or two of blue food coloring in the gel and make an ocean themed bag with shells and little underwater animals. I've even seen a glow stick sensory bag! The ideas are endless! What kind would you want to make? Love the idea. Duct tape is amazing for anything and everything. Might have to give this a go for the little guy this weekend. It definitely looks colorful and fun. I'm sure babies would love it!